Performing and teaching for this year’s Festival/Academy, Kevin Kenner, top prize winner of the 1990 International Chopin Competition in Warsaw, serves as this year’s Artistic Director. Since 2015 he has also been teaching full time at the Frost School of Music. Previously, he taught for 11 years at the Royal College of Music in London, and has served as Visiting Professor at the Academy of Music in Łódź, Poland. Joining the Academy faculty once again is Dang Thai Son, who came to prominence in 1980 by winning First Prize and the special prizes for mazurkas, polonaise and concerto at the International Fryderyk Chopin Piano Competition in Warsaw. He began learning piano with his mother in Hanoi and continued his studies with Vladimir Natanson and Dmitry Bashkirov at Moscow Conservatory. Since winning the Chopin Competition, his career has taken him to over forty countries. Teaching individual lessons to this year's Academy students, internationally renowned Polish pianist Katarzyna Popowa-Zydroń serves on juries of many international music competitions, including the 2015 International Chopin Piano Competition, where she served as chair. Since 1980 she has forged a distinguished career as an instructor, teaching some of the world’s most promising young pianists, including Rafal Blechacz, the top winner of the 2005 International Chopin Competition. Offering daily open lessons, Chopin prize-winning pianist Margarita Shevchenko, a musician of "uncommon sensitivity and refinement," is one of the leading young pianists on the international concert platform today. She has been the recipient of the "Special Chopin Prize" at five competitions in addition to seven top prizes she has won at major international piano competitions in Europe, Japan and the United States. Chopin International Piano Competition prize winner Ewa Pobłocka joins the Academy for the first time. Coming to us from the Academy of Music in Bydgoszcz, Poland, Ewa Pobłocka has gained a reputation as one oft he world’s most respected teachers of Chopin’s repertoire, particularly Chopin Mazurkas, for which she won a special prize in the 1980 Chopin Competition. She has also served on the jury of the International Chopin Competition and many others. This year’s Academy lecturer is the eminent scholar John Rink, one of the world’s foremost authorities on the music of Fryderyk Chopin. He is a prize-winning author and expert on the manuscript and printed sources for Chopin’s works, the performance history of the composer’s music over the past two centuries (including Chopin’s own performing practices), analysis of the repertoire, on editorial practices, and aspects of critical reception. Enlightening audiences with his rich knowledge of music at the opening of each of this year’s Festival concerts, Frank Cooper, known and admired for his ability to communicate the pleasures of any subject in the arts to his hearers, is Research Professor Emeritus of Music at the University of Miami. Eighteen seasons of twice-yearly special courses in Musical Experiences for Adults have set a record for drawing repeat registrants in Miami. Joining this year’s Chopin Festival, the Escher String Quartet will perform both the opening concert as well as a concert featuring winners of the Chopin Concerto Audition. The Escher Quartet has received acclaim for its expressive, nuanced performances that combine unusual textural clarity with a rich, blended sound. A former BBC New Generation Artist, the quartet has performed at the BBC Proms at Cadogan Hall and is a regular guest at Wigmore Hall. 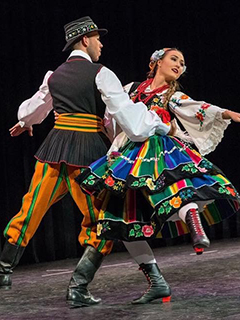 For the Academy’s final workshop and social event, our students will enjoy an evening learning to dance traditional Polish folk dances with members of the Polish American Folk Dance Company, one of America’s oldest and most prestigious companies for Polish dance, based in New York and established in 1938 to perpetuate authentic Polish dances in the melting-pot of America.